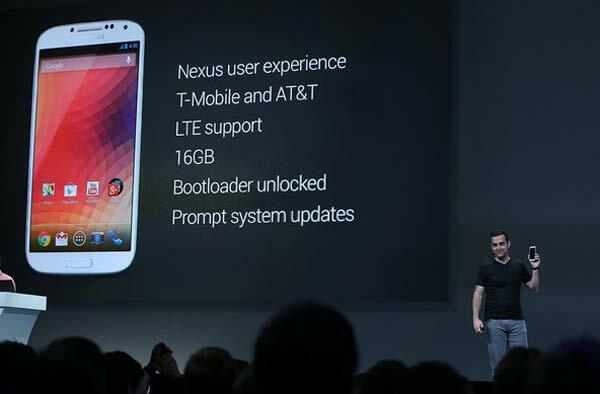 A few days ago during Google I/O the company took the wraps off a version of the Samsung Galaxy S4 that also incorporated a Google Nexus experience. the key difference between it and the existing version of the S4 is that Google version would run stock Android Jelly Bean and that means it is much more customisable by the maker. So on the Google model, for example, you wouldn’t have those Samsung apps and interface. Well the bad news is that it doesn’t appear to be heading to the UK, at least for now. Google has confirmed that the handset, which will be available in the U.S. on June 26, will only be US for the time being. There is clearly a demand for Stock Android on both sides of the Atlantic, so it will be interesting to see if any other makers – coughs, HTC – offer it.